On the website of RCTT under "Manuals" are placed the updated manual of the Enterprise Europe Network (EEN) - EEN Profile Drafting Guidelines (Version 4.1, Updated: 29 November 2016). Two organizations of the National Academy of Sciences of Belarus will be present at the 6th International agricultural fair "Agrosalon 2017" (28.03.2017 - 01.04.2017, Nitra, Slovakia). 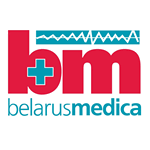 Eight organizations of the National Academy of Sciences of Belarus will be present at the XXIV Belarusian Medical Forum including the "Healthcare of Belarus 2017" ("BelarusMedica") (21-24 March 2017, Minsk, Belarus). Four organizations of the National Academy of Sciences of Belarus will be present at the XV International specialized exhibition "Biotech World 2017" in the frame of IX International Congress Biotechnology: state of the art and perspectives (20-22 February 2017, Moscow, Russia). Three organizations of the National Academy of Sciences of Belarus will be present at the International Defence Exhibition & Conference IDEX - 2017 (19-23 February 2017, Abu Dhabi, UAE). Five organizations of the National Academy of Sciences of Belarus will be present at the TRANSFIERE, 6th European Forum for Science, Technology and Innovation (15-16 February 2017, Malaga, Spain). The schedule of participation of the NAS of Belarus in exhibitions and fairs in 2017 published on the Virtual exhibition of the National Academy of Sciences of Belarus. 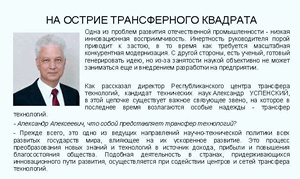 In the "Director" Magazine (№1, 2017) published the interview of Dr. Alexander Uspenskiy, Director of RCTT "At the Forefront of Technology Transfer". 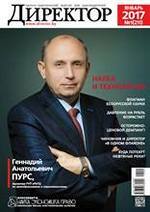 The "Director" is a specialized Belarusian business magazine for managers. February 9, 2017 Mr. Azamat Sadykov and Mr. Dossan Madvakassov, managers of the Kazakh Centre for Transfer and Commercialization of Agrotechnologies (AT2) visited RCTT. In the frame of the Memorandum of Cooperation between the Republican Centre for Technology Transfer and the Office of the Commission for the Management of Qingdao International Academician Park (QIAP) from 19 December 2016 RCTT published information about QIAP.